The Sounds that Heal are the Six Healing Sounds and related postures helping to restore, balance, and cleanse the vital organs. They also stimulate the Chi flow throughout the body to enhance one's overall health and vitality. The Cosmic Six Healing Sounds and their postures help to release any excess heat that may be trapped in the cooling sacs which surround each organ. This booklet will show you how to assume the postures and produce the sounds sub-vocally; their vibrations redistribute any excess heat into cooler regions of the body where it can safely be stored or used. 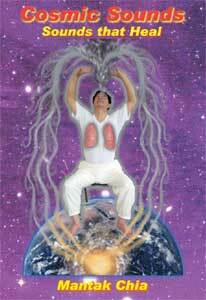 Once the organ energies are balanced, you have a good foundation for establishing and nurturing the virtue energies. This will help to maintain the Chi balance throughout the system. Practice of the Cosmic Six Healing Sounds will restore and maintain your calmness and good health. Greater sexual pleasure and improved digestion will occur. Minor ailments, such as colds, flu, and sore throats, can be prevented or thrown off easily. Several psychologists have taught some of their patients to use the Cosmic Six Healing Sounds to relieve depression, anxiety or anger; and body work oriented healers have used the Six Healing Sounds to help speed up healing, and the healer spends less life force energy.